Drying is by far the most useful large scale operation method of keeping solid foods safe for long periods of time, and is of fundamental importance in most sectors of food processing. Drying operations need to be precisely controlled and optimized in order to produce a good quality product that has the highest level of nutrient retention and flavor whilst maintaining microbial safety. 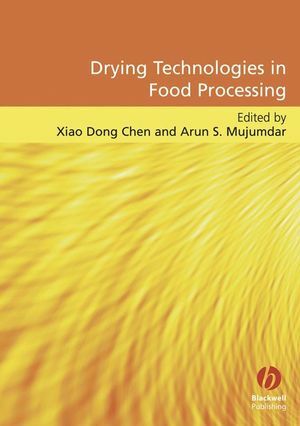 This volume provides an up to date account of all the major drying technologies employed in the food industry and their underlying scientific principles and effects. Various equipment designs are classified and described. The impact of drying on food properties is covered, and the micro-structural changes caused by the process are examined, highlighting their usefulness in process analysis and food design. Key methods for assessing food properties of dried products are described, and pre-concentration and drying control strategies are reviewed. Thermal hazards and fire/explosion detection and prevention for dryers are discussed in a dedicated chapter. Where appropriate, sample calculations are included for engineers and technologists to follow. The book is directed at food scientists and technologists in industry and research, food engineers and drying equipment manufacturers. Xiao Dong Chen and Arun Mujumdar. Images of foods and dried products. 2. Water activity of foods. Bhesh Bhandari and Benu P. Adhikari. 3. Food biological changes during drying processes. Xiao Dong Chen and Kamlesh C. Patel. 4. Spray drying of liquid foods. Bhesh Bhandari, Kamlesh C. Patel, Xiao Dong Chen. 5. Low-pressure superheated steam drying of food products. Sakamon Devahastin and Peamsuk Suvarnakuta. Raisul Islam and Arun Mujumdar. 7. Freeze and vacuum drying of foods. 8. Post-drying aspects for meat and horticultural products. 9. Food dryer process control. 10. Fire and explosion protection in food dryers.